Manufacturer of a wide range of products which include potassium humate 12% (humic acid with fulvic fractions) and super potassuim humate 95%(crystalline). HUMIC ACID WITH FULVIC FRACTIONS. SENSOR contains some natural auxins, which enhances cell division & cell elongation. 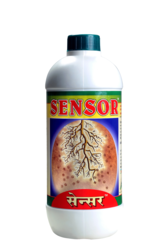 This helps in increasing root growth,this effect can be easily noticed on crops like Onion, Potato & Ginger. SENSORhelps in increasing the number of useful microorganism that ultimately subsides the population of harmful Microorganisms. SENSORis useful in stabilizing Nitrogenous fertilizers. SENSORincreases availability of Phosphorous in the soil. SENSORis useful in neutralizing the pHof soil; recommended application is 1 to 2 Liters per irrigation. SENSORhelps in increasing availability of major & microelements to plant. SENSORincreases the natural synthesis of various plant hormones within plant. SENSOR increases absorption of P, K, Mg, Fe, Cu & Zn by plants. Foliar Spray :-100 ml to 200 ml per 100 Liter of Water. Soil application / Fertigation :- Add. 1 Liter to 2.5 Liter in 1000 Liter of water & apply through drip irrigation or as sidedressing on one acre of crop. SENSOR is compatible with almost all plant protection chemicals except with those acidic in nature. LEONAR is the organic nutrition for all the crops. LEONAR contains potassium humate 95% It is 100% water soluble & can be useful for fertigation through drip irrigation / drenching &for foliar spray. Soil detoxification :- LEONAR enables toxic residues to be isolated & removed from the soil. Sodium management :- Damage from high sodium water can be considerably restricted by adding 250 gram of LEONAR per acre with each irrigation. pH buffering :- LEONAR can neutralize the negative effect of pH extremes, which have a profound effect on nutrient availability. Hormonal stimulation : LEONAR contains an auxin like growth hormones, which can enhance cell division & cell elongation. Root zone chelation :-When LEONAR applied to the root zone, becomes root zone facilitator, chelating applied nutrient & those already existing in the soil. Better root & shoot growth. Increased absorption of major & micronutrients. LEONAR is eco– friendly in nature. FoliarSpray :- 0.5 gram to 1 gram per liter of water. Soil application / Fertigation:-250 gram to 500 gram acre through drip irrigation / drenching. 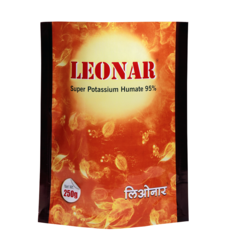 Compatibility :-LEONAR can be mixed with fertilizers, preferably use alone.